Republic, Slovakia, Montenegro, USA, Spain, Italy, Portugal, Austria, Hungary, Vietnam, Iceland, Mexico and Greece. 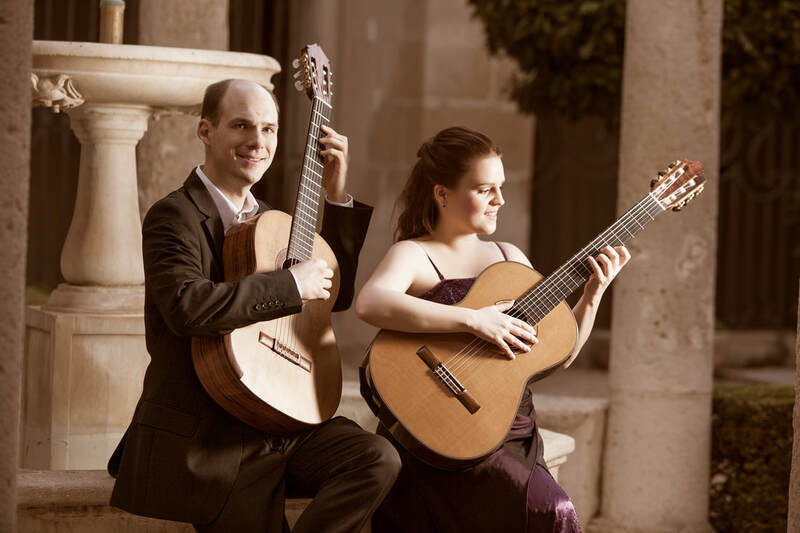 In August 2009, the duo participated in its first competition, taking second prize in the Transylvania International Guitar Competition open chamber music section. In 2010 they won several concerts with the German organisation “Live Music Now”. ​In July 2012 they won the second prize in the international guitar competition Olsztyn (Poland). In August 2014 they won 1st Prize with unanimity of the jury in the chamber music section of the “Nuits musicales de Cieux”, France. Between them they have won prizes as soloists in 13 international competitions across the globe. After undergraduate, graduate and post-graduate courses in The Netherlands, Spain, and Australia, Véronique and Harold studied together as a duo with the Duo Melis in Strasbourg (France). Both guitarists enjoy the contrast of their very different musical backgrounds. They find that the contradictions between their approaches bring additional depth, playfulness, and interest to the music they interpret together as a duo. They play a program of works of many genres and time periods, and delight in sharing their interpretations with a wide range of audiences.